What are private sector partners doing with Clearjel? What is the correct spelling of Clearjel? 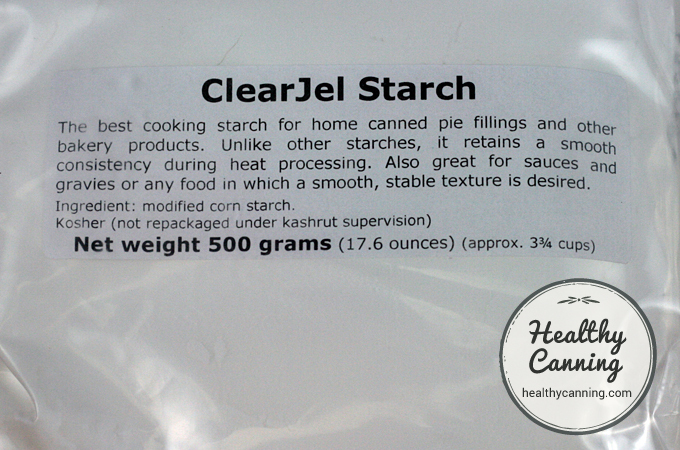 Clearjel ® is a modified corn starch that has been accepted by the USDA and the National Center for Home Food Preservation for a single canning application as of 2015, which is for use as a thickener in some fruit pie fillings. Beyond that, it has also been accepted for a few additional tested canning applications by some University Extensions, as well as by the Jarden company in America and Canada. Clearjel, which is a proprietary name, is made by the Ingredion company (formerly the National Starch and Chemical Company) of Bridgewater, New Jersey. PermaFlo®, ThermFlo® and Thick Gel ® are commercial equivalents that have been accepted equally along with Clearjel by some University Extensions. 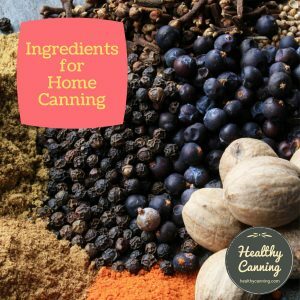 One of the concerns in home canning about most thickeners is that because the thickener thickens as soon as heat starts to hit the food product being canned, density issues may be encountered causing insufficient heat penetration for complete processing of the jar and therefore an unsafe product. Clearjel (and its equivalents) differ from other thickeners in that they only thicken a small amount when heat first hits them; the real thickening starts only as the food item starts to cool. 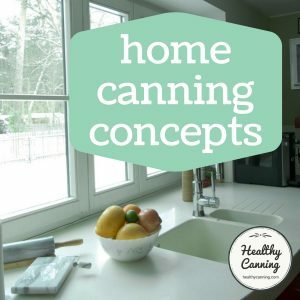 In home canning terms, this means possibly in theory that because Clearjel (and its equivalents) might hold the promise of not interfering with heat penetration during the heating phase, it may eventually find application in other home canned products such as syrups or soups. But there are no lab-tested, certified-safe recipes for such applications as of 2015. 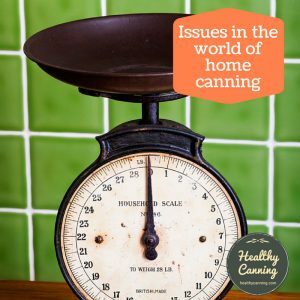 While from the safety point of view the concern is about when the thickening happens, from a quality point of view there’s also the performance question: does the thickener go lumpy in the heat of canning? From a cook’s point of view, is it desirable as an actual thickener? 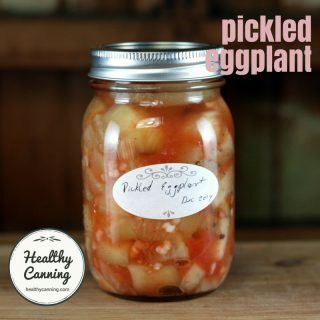 Still others say that canning your fruit plain with no thickener whatsoever makes a jar of it more versatile; that should you choose to use a jar of fruit for pie, it’s easy enough to sprinkle some starch ( be it corn starch, flour, tapioca) over it in a pie shell as you would for fresh anyway. Clearjel is very hard to source still even as of 2015 for consumers, even though it is broadly used commercially by the tons, and if you are not in North America, your chances of getting it are sadly probably slim to none. If you are wondering why some official canning recommendations were based on a relatively obscure, hard to find ingredient, this quote may explain why: “The marketing plans being discussed for Clearjel® at the time home-canned pie filling recipes were developed have never materialized. Unfortunately, Clearjel® is available only through a few supply outlets and is not currently available in traditional grocery stores.”  Andress, Elizabeth L. Purchasing and Using Clearjel. University of Georgia cooperative Extension. FDNS-E-116. July 2005. Accessed March 2015 at https://spock.fcs.uga.edu/ext/pubs/fdns/FDNS-E-116.pdf That statement was made in 2005, and the situation hasn’t changed 10 years later, in 2015. Clearly, the USDA people had expected broader distribution of the Clearjel product at a consumer level, and were let down. 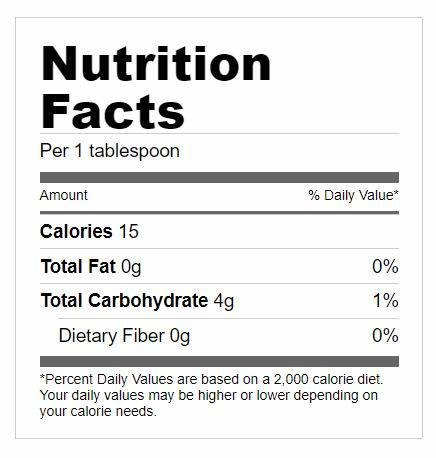 When you are shopping for it, you may be more likely to find it in bakery-supply stores than bulk or health-food stores. 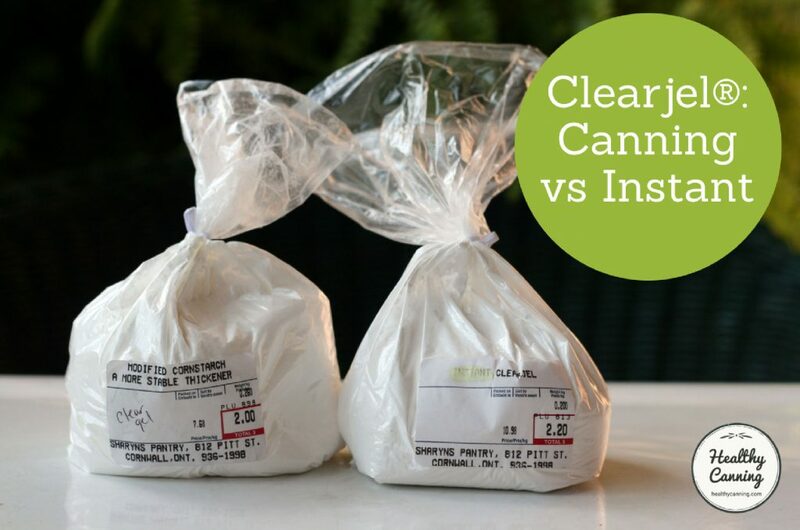 These stores have to buy it in large 50 lb (22.7 kg) commercial quantities, and then break it down into small bags, usually of 1 pound or 1/2 kg, for consumers. Expect to pay anywhere from 4 to 8 dollars per pound / 500g. On average, a l pound / 500 g bag will do one batch of 7 large jars of pie filling. Here’s a sample link for an Amazon seller of it but do shop around as prices vary dramatically for what is the same product. There about 3 1/4 cups in 1/2 kg of Clearjel. So there is no approval from the center — the USDA / NCHFP — for use of the modified starch called Clearjel in anything other than those four pie fillings. That being said, given that the Clearjel makers didn’t follow through on making the product available at a consumer level, it would seem apparent that neither the USDA or NCHFP would have any great incentive to develop more uses for a product their audience can’t get hold of. Note: Oregon State Extension as of 2013 allows for the use of Clearjel in Apple, Blackberry, Blueberry, Cherry and Peach canned pie fillings  Food Safety & Preservation: Fruit Pie Fillings. OREGON STATE UNIVERSITY Extension Service. SP 50-616, Revised February 2013. Accessed March 2015 at https://extension.oregonstate.edu/fch/sites/default/files/documents/sp_50_616_fruitpiefillings.pdf So they’ve added one pie filling — blackberry. They did it by allowing the USDA cherry recipe to accept blackberry as a substitute. The National Center for Home Food Preservation says that in the USDA pie filling recipes, you must use Clearjel and can make no substitute. This is likely because those recipes have only been tested for safety and quality with Clearjel, and they can’t support variances or recommendations that they haven’t lab tested themselves. It is made by Ingredion, the same company that makes Clearjel, but may not be any easier to find than Clearjel as it only appears to be sold in very large quantities. Thermflo. Photo courtesy of Ronda R. Heding-Pedley, 2017. Utah State Extension recognizes Thick Gel as an alternative for Clearjel. Thick Gel advertises itself as gluten-free, and non-GMO. 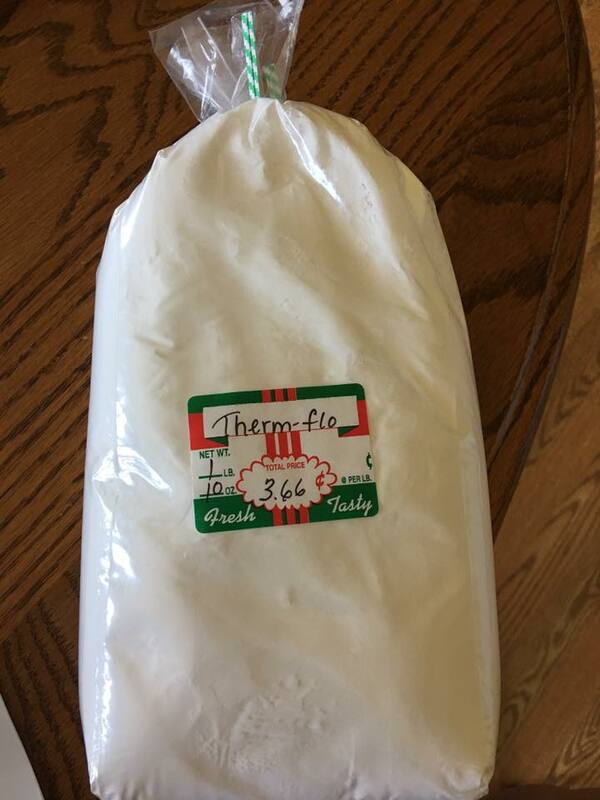 Thick Gel is made and marketed by Cornaby’s, a Utah company, so the Utah State Extension would have likely had good access to the product and manufacturers for testing and consultation. ( Q) I’ve used Clearjel® as a thickener for home-canned pie fillings. 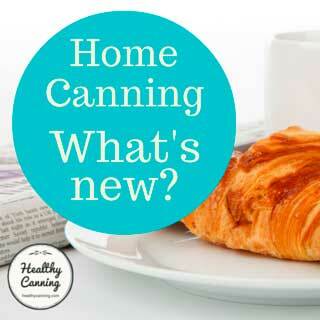 Can I also use PermaFlo® and ThermFlo® for home-canned pie fillings? ( A ) PermaFlo® and ThermFlo® are other forms of modified starches and are available for commercial use. 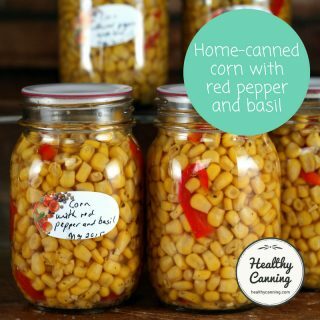 Because there is no available research on the use of these products for home food preservation, we recommend you continue to use Clearjel® which has been tested for adequate heat penetration in the water-bath canner and provides excellent pie filling quality.”  Home Food Preservation Newsletter. University of Minnesota Extension. September 2011. 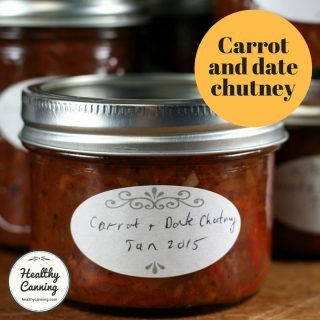 Accessed March 2015 at https://www.extension.umn.edu/food/food-safety/home-food-preservation-newsletter/docs/home-preservation-sept-2011.pdf . Page 4. It’s important to remember that universities and governments aren’t the only ones equipped with testing labs and trained professionals. The Newell (formerly Jarden) companies (Ball in the US and Bernardin in Canada) also have their own labs and professionals to develop tested, safe, quality recipes. As of 2015, there is still not a single recipe in the Ball Blue Book where Clearjel is drawn on. Instead, Ball continues to rely heavily on refined sugars and refined syrups such as corn syrup as thickeners. 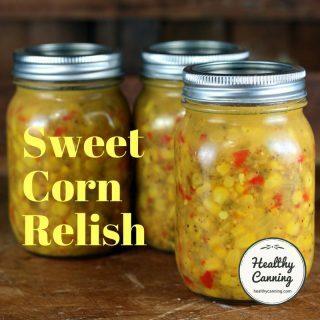 The Ball / Bernardin Complete Book (2015) has a “Homestyle Corn Relish” recipe calling for 2 tablespoons of Clearjel as a thickener. 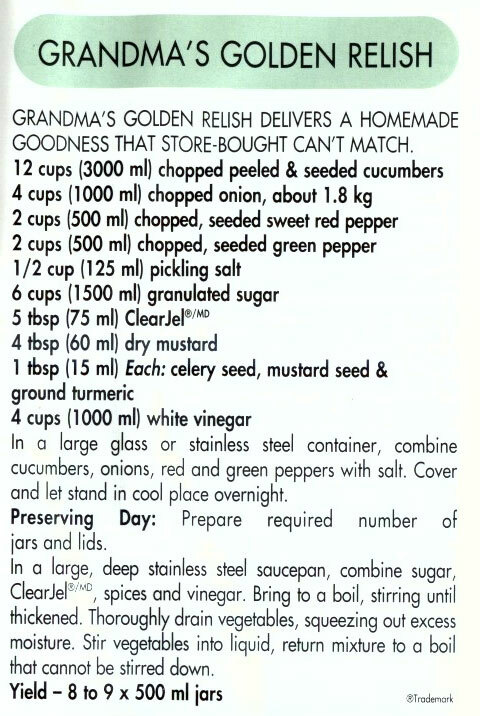 Other recipes calling for Clearjel include Golden Relish, Fennel Relish, Mustard Pickles, Marrow and Onion Mustard Pickles, Mustard Beans, and a small handful of pie fillings. 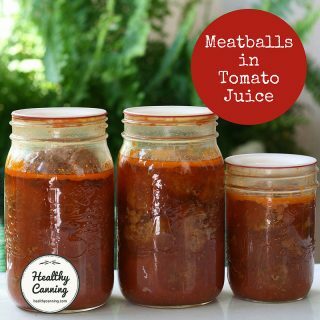 The Ball / Bernardin Complete Book (2015, page 397) allows the canning broth for cubes or strips of meat to be slightly thickened with Clearjel. “If desired, ClearJel can be used to lightly thicken the broth in this recipe.” Kingry, Judi and Lauren Devine. Ball / Bernardin Complete Book of Home Preserving. Toronto: Robert Rose. 2015. Page 397. They do not state what “lightly” means. On their web site, Ball extended the range of pie fillings using Clearjel by providing a recipe for Raspberry Pie Filling thickened with Clearjel. Bernardin calls for Clearjel in a few pie fillings (Blueberry, Cherry and Raspberry Pie fillings, page 40), but branches out beyond that to use it for two relishes as well. In the relishes, it possibly replaces what might have been the now politically-incorrect flour in the old days. 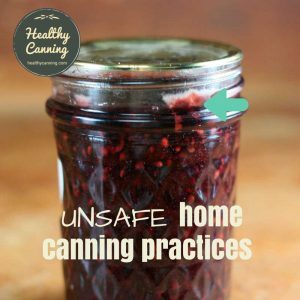 Here are Washington State University Extension’s recipes for home canned jams made using Clearjel. Here is a Blueberry Jam with Clearjel we made using one of their recipes. The University of Nebraska Extension people, though, are not prepared to even ponder the use of Clearjel in preserves. They start, and end, the discussion with: “Clearjel is not recommended for jams or jellies….”  Albrecht, Julie A. Let’s Preserve: Jams, Jellies, and Preserves. University of Nebraska Lincoln Extension. EC448. August 2010 Revision. It’s the Washington State University Extension Team that seems either to be the black sheep of the family on this one, or, to be willing to take one for the team, and go out on a limb and actually give recipes for home-canned jams using Clearjel. But to be clear: the National Center doesn’t have any experience with these and didn’t know about them. 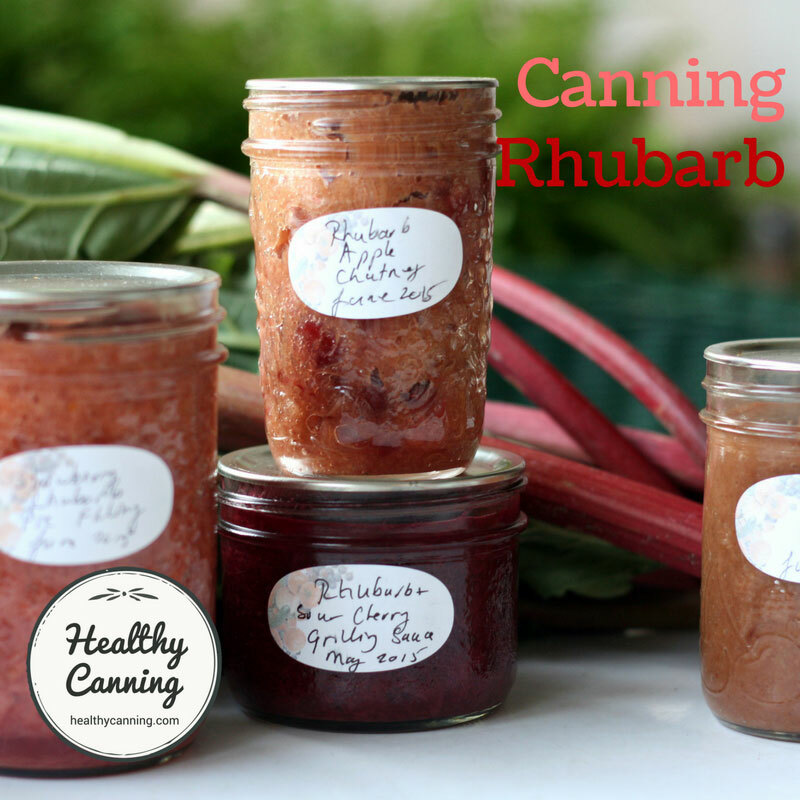 Here are Washington State University Extension’s recipes for home canned jams made using Clearjel. These recipes were released in October 2007. 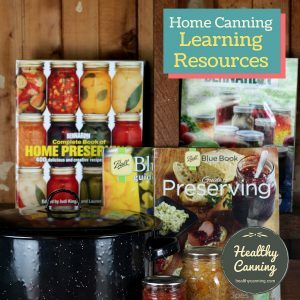 There is no record that we know of, as of spring 2017, of any reputable, certified source testing any pressure canning recipe with Clearjel in it. Such recipes should be avoided; add your Clearjel thickener instead upon opening the jars of food for use. 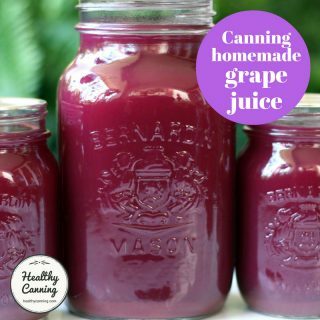 The recommendation to use Clearjel in a few tested home canning recipes is not a magic pass for it to be used willy-nilly in any canning recipe. It’s as difficult to find the correct spelling of Clearjel as it is the product itself: you will see Clear Jel, ClearJel, Clear Gell, etc. You usually can’t go by the spelling on the packages we’ll see as end-user consumers, as it’s almost always re-packaged into smaller packages by third-party vendors, who spell Clearjel however seems best to them. The spelling of Clearjel in all the home-user sized packages pictured on this page, and in many of the quotes that are cited, would appear to be incorrect. The USDA guides opt for Clear Jel. Barry’s Farm in the states lists all spellings other than Clearjel as variants. https://www.barryfarm.com/nutri_info/thickeners/clear_jel_regular.htm. Accessed May 2015. All filings (of which there are many) at the US patent office referencing the product use the spelling of Clearjel®. Consequently, we have opted to go with that spelling: Clearjel. 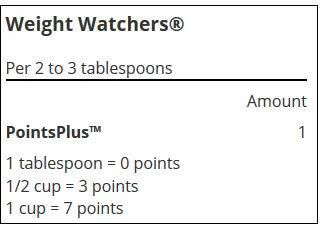 Compared to regular cornstarch, Clearjel has about half the Weight Watchers points. 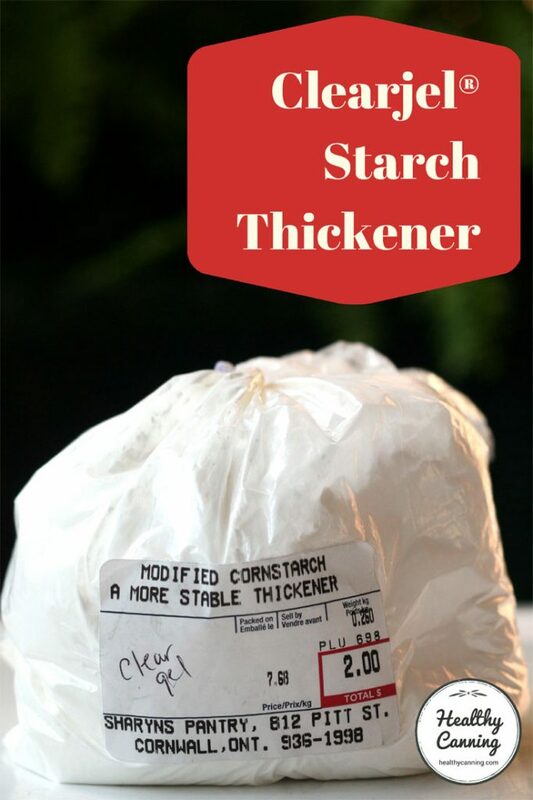 Cornstarch is roughly a point a tablespoon, 6 points per 1/2 cup, etc. As shipped direct from the factory, as of April 2017, Clearjel is certified non-GMO, Halal, Kosher, and made from American corn. It is free from most known allergens save for trace portions of sulfites. Note that this status is not guaranteed once it is received by a smaller retailer and handled for repackaging into smaller portions for end-users. The following fact sheets are from Ingredion’s Canada and US fact page for Clearjel, as of April 2017. We’d recommend you always check there for updated information. Note: if you are buying Clearjel outside Canada or the US, it may be made more locally to you. For instance, Instant Clearjel (the non-canning version) that is sold in Australia, is made in Australia from Australian corn. 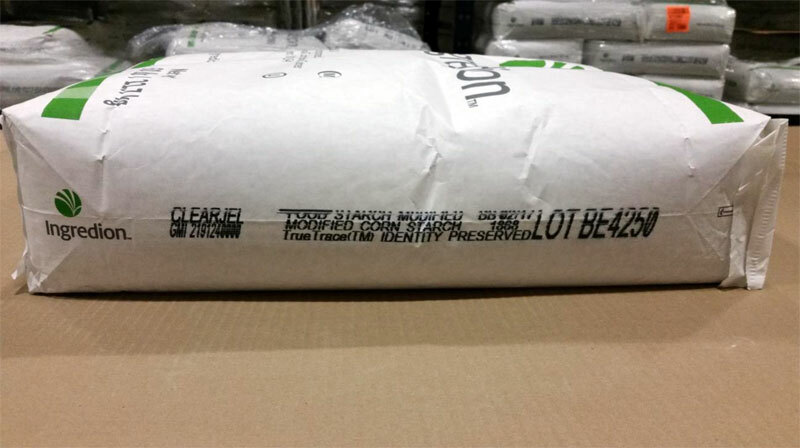 ” INSTANT CLEARJEL™ starch is manufactured at Ingredion’s Lane Cove plant in Sydney, Australia utilising Australian grown waxy maize.” ”Achieve great performing pie fillings every batch, every day.” Accessed April 2017 at https://apac.ingredion.com/landing/nzpie.html. Clearjel Europe, Middle East, and Africa fact page. 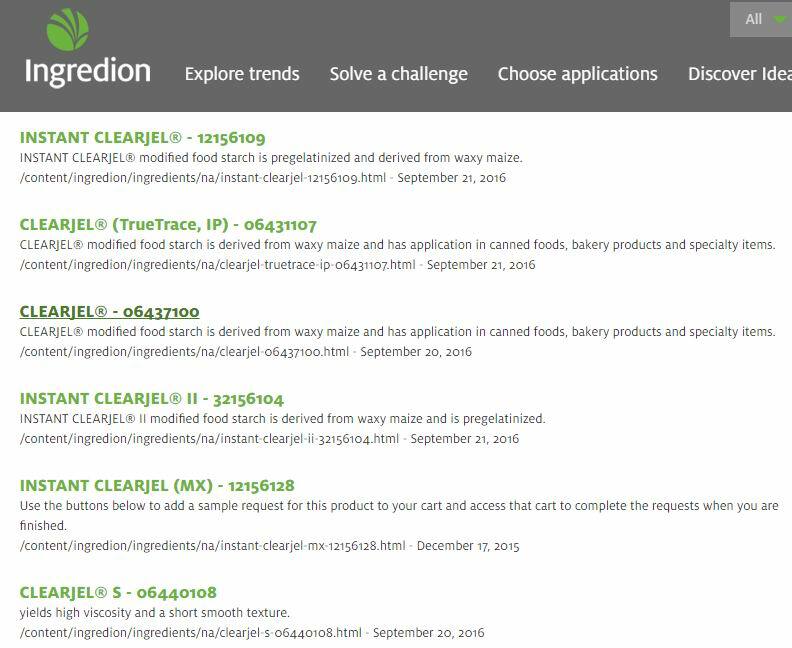 If you are interested in country of origin or other info for your region, (1) go to https://www.ingredion.com/, (2) find the site for your region, and (3) search on “Clearjel” (all one word) to see if separate info is provided. Clearjel in fruit pie fillings: Garden-Robinson, Julie. Let’s Preserve Fruit Pie Fillings. North Dakota State University Extension Service. September 2012. FN-434. Oozing canned pie filling. Ingham, Barb. Blog posting. University of Wisconsin Extension. 23 October 2017. 8. ↑ User digdirt2 on Gardenweb forum. Comment made 27 August 2012. Accessed May 2015. 21. ↑ Home Food Preservation Newsletter. University of Minnesota Extension. September 2011. 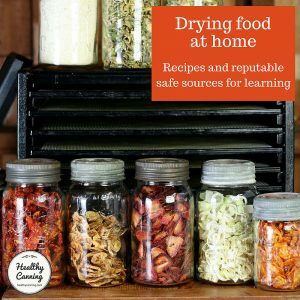 Accessed March 2015 at https://www.extension.umn.edu/food/food-safety/home-food-preservation-newsletter/docs/home-preservation-sept-2011.pdf . Page 4. 22. ↑ Kingry, Judi and Lauren Devine. Ball / Bernardin Complete Book of Home Preserving. Toronto: Robert Rose. 2015. Page 397. 25. ↑ Albrecht, Julie A. Let’s Preserve: Jams, Jellies, and Preserves. University of Nebraska Lincoln Extension. EC448. August 2010 Revision. 26. 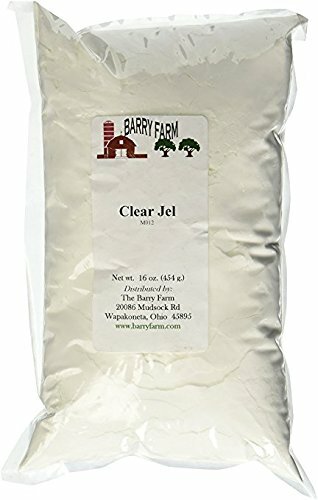 ↑ https://www.barryfarm.com/nutri_info/thickeners/clear_jel_regular.htm. Accessed May 2015. 27. ↑ ”Achieve great performing pie fillings every batch, every day.” Accessed April 2017 at https://apac.ingredion.com/landing/nzpie.html. Your best bet might be to track down baking supplies stores.